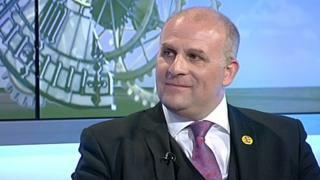 A UKIP MEP has said he was subjected to racist abuse on social media because of his Romany gypsy background. James Carver, who represents the West Midlands, said he received "deeply offensive" tweets referring to him as a "pikey". The word is regarded as a derogatory term for members of the traveller community. West Mercia Police confirmed it had received a complaint and was looking into Mr Carver's allegations. Mr Carver, 64, said he would "not tolerate such comments, least of all from so-called internet trolls". "The public must comprehend that the everyday use of this word only serves to further stigmatise these forgotten communities," he said. "It is as offensive as racist expletives that are used against other minorities." Police confirmed the complaint had been received at a station in Worcester last week.